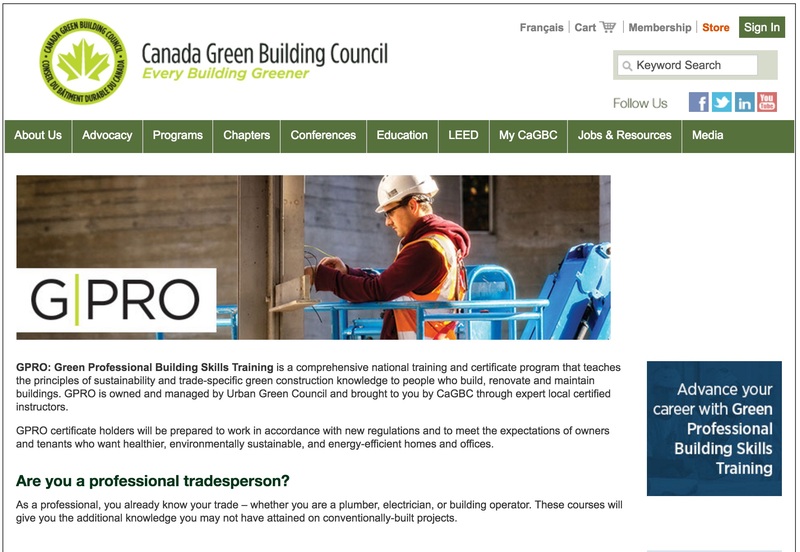 In order to meet growing demand for skilled workers in the green building field, the Canada Green Building Council (CaGBC) and Urban Green Council (the New York Chapter of the U.S. Green Building Council) have announced a strategic partnership to bring Green Professional Building Skills Training (GPRO) to professionals across Canada. Geared at trade professionals, Green Professional Building Skills Training (GPRO) consists of a series of courses and certificate exams developed by Urban Green Council that aim to close the gap between conventional and sustainable construction practices. GPRO courses are taught to impart the principles of sustainability by way of trade-specific knowledge. Since the program launched in 2011, over 8,000 people have received GPRO training across the U.S. and Canada. “It is clear that Canada’s building industry is embracing greener, higher performing buildings as best practice,” says CaGBC president and CEO Thomas Mueller. “We are introducing GPRO to meet the demand for trained construction professionals which are knowledgeable and skilled to deliver top quality buildings in the growing green building industry. Canada is a global leader in green building with the highest number of LEED buildings per capita in the world. A recent CaGBC report titled Green Buildings in Canada: Assessing the Market Impacts and Opportunities further confirmed this, projecting that LEED projects (those that have certified between 2005 and end of 2015) will generate approximately $62.3 billion in total GDP and create over 701,000 direct jobs over their lifetime. Builders and operators are already using GPRO certified trained professionals to bring LEED into their projects across the United States and in the Greater Toronto Area. Offering GPRO training nationally means bringing a much-needed set of green skills training to Canada’s construction industry, and in turn supporting Canada’s economic and societal push toward actionable solutions to climate change. The Toronto Chapter of the CaGBC has been offering GPRO education in the GTA since 2015. The CaGBC is currently preparing course material and will roll-out the first round of national training in the fall of 2016. Certified trained professionals will earn AIA and GBCI credits while completing the training. For more information on GPRO and CaGBC Education’s additional offerings, visit www.cagbc.org/gpro.